Statutory Guidance 2018 places schools under a duty to secure access to independent careers guidance for their pupils in school years 7-11. Careers guidance secured under the new duty must adhere to the Gatsby Benchmarks which are a result of the report by Sir John Holman. Headteachers, school staff and governing bodies must have regard to this statutory guidance issued by the Secretary of State in exercising their functions under this section. Schools have a role to play in supporting their pupils to make well informed and realistic decisions by providing access to impartial and independent information and guidance about the range of education and training options that are most likely to help young people achieve their ambitions. This information has become increasingly important as young people are now required to participate in education or training until the end of the academic year in which they turn 18. In fulfilling their new duty, Notre Dame School will secure access to independent face-to-face careers guidance where it is the most suitable support for young people to make successful transitions, particularly children from disadvantaged backgrounds Notre Dame School will consider a range of wider careers activities such as engagement with local employers and work-based education and training providers to offer all young people insights into the world of work and with local colleges and universities for first-hand experience of further and higher education. This will include mentoring, workplace visits, work experience, work shadowing, enterprise events, employer talks and links with higher education institutions. The Statutory Guide for Careers Education in line with Section 42a and Section 45a of the Education Act 1997 states that schools must secure independent careers guidance for young people. Notre Dame School employs an independent careers advisor, Debra Bean, who comes into school one day a week to work with students. The duty of schools is to expand advice and guidance for young people so that they are inspired and motivated to fulfill their potential. Pupils should have high aspirations and consider a broad and ambitious range of careers. Notre Dame School in line with the statutory advice and guidance has sustained contacts with employers, mentors and coaches who can inspire pupils to fully achieve their potential. We work in partnership with local employers and other education and training providers like colleges, universities and apprentice providers ensuring that pupils benefit from experience of the world of work to help them make decisions about education and training options. Careers Guidance is about inspiration and aspiration. Contacts with employer networks, FE Colleges, HE institutions, mentors, alumni or other high achieving individuals can motivate pupils to aim higher and consider wider ranges of education and career options. Work Experience plays an important role in encouraging and inspiring students to aim higher giving them a taste of the world of work. Year 10 students in school go out on placement for two weeks in the summer term. Students are encouraged to ask for help from family and friends to secure a placement. The school offers workshops for curriculum vitae writing and work experience preparation helping students prepare for their placements. All students are helped and supported while finding a placement and all students are visited on their placements by a member of staff. We ensure that students are given the opportunity to be successful on their placements. If you have any queries about Careers or Work Experience please contact Teresa Crowley. The students ran successful campaigns including: a design an oystercard competition, an obstacle course competition to show how students are distracted when using mobile phones and wrote and recorded a rap song called 'Left and Right' about crossing the road. We are very grateful to the Worshipful Association of Saddlers who have very kindly sponsored the Year 10 University trips this year. We appreciate their support and continued generosity towards the school. Ezinne Ike, Kumba Kabba, Chiara Kon, Janine Koroma & Emily Marial. As part of the Hillsong Youth Project we were very fortunate to have a guest speaker Reggie Dabbs come into school three times this year to talk to Year 7, 8 & 11 students in assembly. Reggie is an inspirational speaker who comes to Britain three times a year to hold a school tour. He will over the course of a week visit eleven schools and we were honoured to host him at Notre Dame. Reggie was born in Tennessee to a young sixteen year old who already had three children and was living in a chicken coop, she was taken in by her English Teacher at school Mrs Dabbs and eventually he was adopted by the family after his mother left with his two sisters and brother. Reggie talks about his struggles in at school and how he also struggled with his feelings as he felt unwanted. Reggie plays the saxophone and played us some wonderful songs and we all had a good sing a long – he was an inspiration. such a moving story but showing us how we never know what people are going through but always striving to achieve and do our best. We were fortunate to have 10 students take part in a six week Shine Programme with volunteers from the Hillsong Youth project. The personal development programme is a group mentoring scheme that uses an inspirational practical approach to learning for girls. Over the six weeks the students reflected on themselves in a variety of ways, taking part in team games, group discussions and learning how to look after yourself including learning how to do hand massages! On Thursday March 1st in celebration of World Book Day Peter Western an award winning animator came into school to talk to students from Year 8 in the library. Peter talked about how he became an animator and what inspired him as a schoolboy to want to follow a creative career. Peter was fortunate he went to a school that encouraged his creative talents and from there he attended St Martins School of Art. Peter has worked on films such as ‘Who Framed Roger Rabbit’ where he worked with Steven Spielberg and television series; such as ‘Fungus the Bogeyman’, ‘Horrid Henry’ and ‘The Snowman and the Snowdog’. He showed us examples of his work including advertisements that he had worked on. Peter was awarded a Children’s BAFTA in 2016 and he brought his award along with him allowing us all to hold it – it was heavier than it looked! The BAFTA was awarded for his work and for supporting the next generation of artists and animators passing on his skills through lectures and talks. We also watched his promotional films that introduced the public to the mascots for the London 2012 Olympics Wenlock and Mandeville. Peter held a question and answer session where we were able to ask questions about his career, life and work. The talk was very interesting and we were very grateful to Peter for giving up his time to come into school especially on such a cold snowy day! 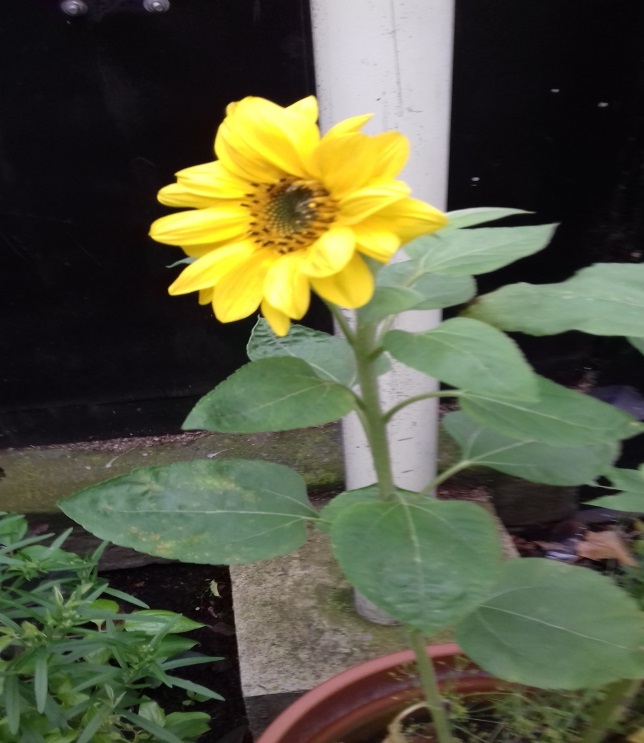 The SJ group has been working hard in the garden this year and for the first time we have a sunflower grown in our garden! They have continued to work hard on the garden the PTA gave the students £151 for plants and the garden is beginning to take shape! We are very grateful to the PTA for their support; they have also just provided a fence to protect the plants. As part of a scheme set up by The Mayor of London to support the delivery of Careers in schools we have been linked to an Enterprise Advisor. This is a volunteer from the world of business who works with the careers department to look at ways of improving and enhancing the careers programme in school. We are very fortunate to have been linked with Sujatha Alexander who is an HR Director for the charity, The Daughters of Charity of St Vincent de Paul who is working with Teresa. 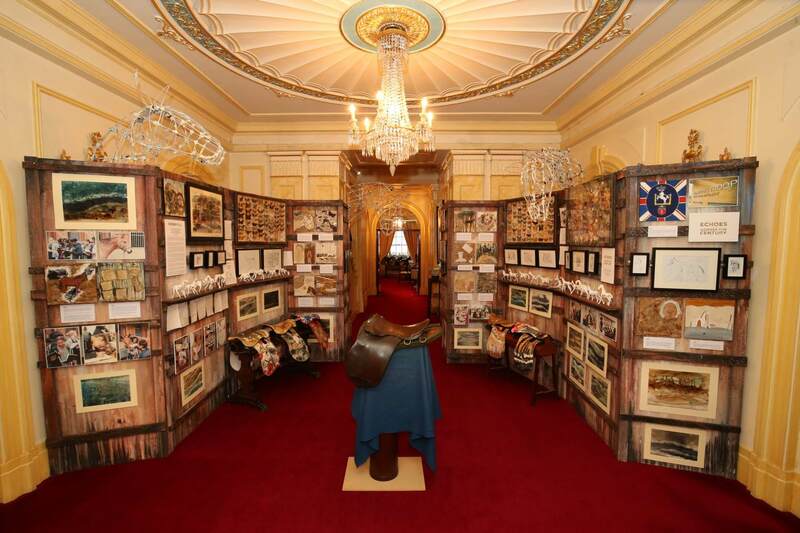 Echoes across the Century took place in thirteen different schools resulting in ten projects which were a joint enterprise between livery companies and schools. The project was based around the goods and services supplied by the city livery companies to soldiers fighting in the First World War. 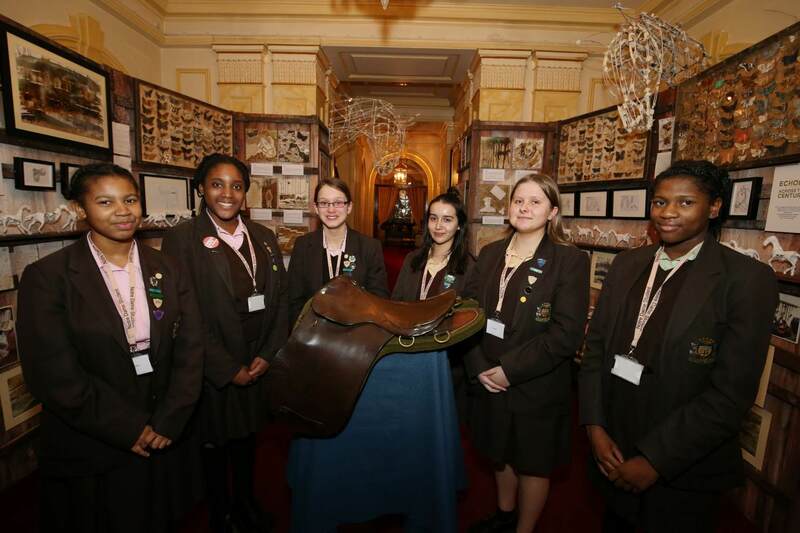 The centre piece of our project was a saddle lent to us by the Worshipful Association of Saddlers that actually went the Somme! The saddle was owned by Major Wayling and was used throughout the war. Six of the students along with Ms Somers the Head of Art, Jane Churchill the Heritage Artist who created the project and Teresa Crowley the Project Manager were invited along to Saddlers Hall to be presented to HRH Princess Royal as part of the Apprentice Awards conducted by the Saddlers. We have been very Fortunate to be part of the project and are grateful to the Worshipful Association of Saddlers in particular Patrick Burns, Alison Trupet from the Livery Company Schools Project and Jane Churchill whose enthusiasm and energy drove the project. The project was funded by the Lottery Heritage Fund. As part of the continued support from the Worshipful Association of Saddlers we were invited to an Open Day at Capel Manor College in Enfield on Saturday 16th June. The students saw the courses offered at the college these included: Tree Surgery, Animal Husbandry, Horticulture, Floristry and of course Saddlery! The day was very informative and we all enjoyed the wonderful grounds at the college. 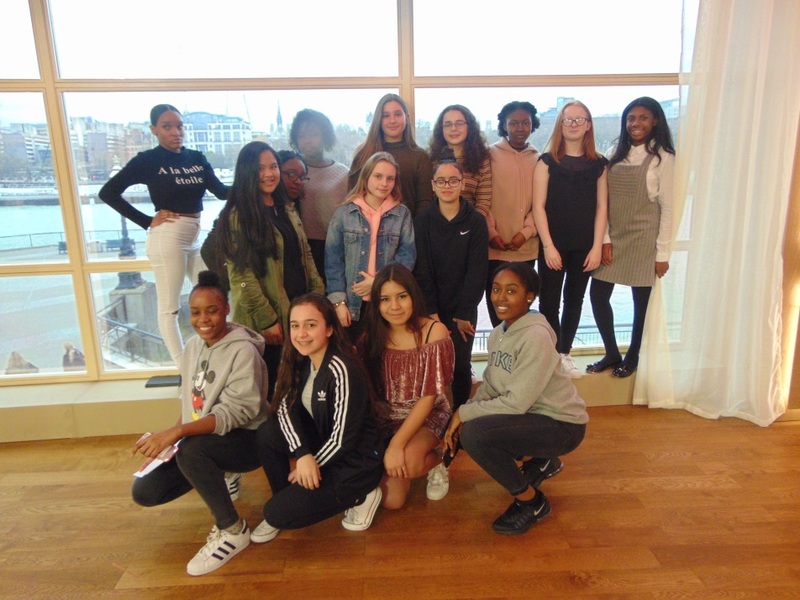 Fifteen students from the Year 10 Media class were invited to take part in a ten week course with ITV Studios, students followed a creative idea and saw how it was made into a television programme and had speakers each week from the stage of the project. We met scriptwriters, commissioning editors, cameramen, lighting professionals, producers, studio mangers and creative editors. The project was inspirational to see how many professionals work in the Media industry and to be able to see how their jobs work and how everyone has to work together to produce a programme. The students were split into two groups and filmed magazine segments, one ‘what is hot and what is not’ and one interviewing a celebrity. The students were all given roles on the day of filming and wrote their own scripts! We filmed the news articles in the This Morning studio sitting on the same sofa as Philip Schofield and Holly Willoughby. The project was wonderful and we are very grateful to ITV for their time and commitment especially Susie Greenwood who was the facilitator over the 10 weeks. We were fortunate to be united to Fieldfisher solicitors who are based in Lower Thames Street one of their main clients is Pfzier Pharmaceuticals so the event was a careers session around Law and STEM. (Science Technology, Engineering and Maths). We were welcomed to Fieldfisher by Alison Dennis one of the senior partners at Fieldfisher. The day started with a panel discussion – the panel talked about their careers and career pathways showing how different people take different paths in their careers. The discussion finished with a question and answer session. The students then had a talk from student ambassadors who were studying at Kingston University – they talked about life as a student, ‘A’ Level choices, their journey to university and day to day life at university. The students then split into groups and took part in a speed networking event they moved around the room and spoke to professionals from a range of careers. Fieldfisher very kindly supplied lunch and then we went out onto their balcony on the 9th floor to look over London which was great! The event was a wonderful opportunity for us to meet with successful women and we are very grateful to Fieldfisher Solicitors especially Jay Wetterau who organised the visit. Two Year 9 students met Pele at the Olympic Park in Stratford as part of the Making the Future exhibition organised by Shell. Josephine Ayodele and Keliss Nesbitt Morgan took part in a competition around Kinetic Energy which saw eight students from four schools run on a kinetic pad to produce energy which converted in time that could be spent shooting goals at a target, we were in a live competition with Lagos. The students were given England football strips that they were allowed to keep and signed Brazil shirts from Pele; we were also accompanied on both the rehearsal day and the event by Andy Akinwolere, a former Blue Peter presenter who coordinated the event. 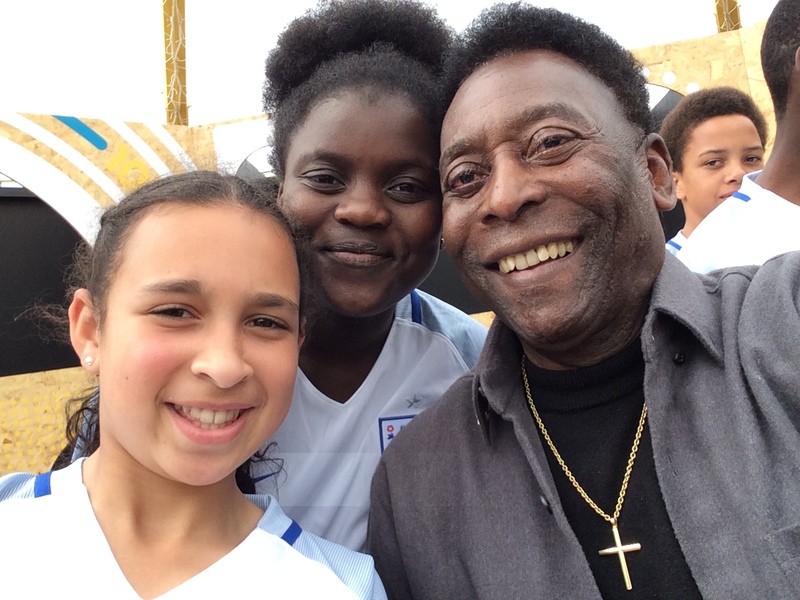 The girls had a day they will never forget and Pele is iconic and it was such a privilege to meet him! We are very fortunate now to have three Kings Scholars Schemes running in school in total there are seventy five students involved in the programme which supports students over three years giving them opportunities and access to university life. Year 9 students this year have taken part in a Careers Carousel; they spent a day at Kings College taking part in a session with Learning Performance who showed them examination revision tips and study skills using different skills. This was a great session which explained how key items and objects can be triggers for the memory. The Year 9 students then had a five week after school club which each week focused on different careers including, Medicine, Law, The Civil Service, The Creative Industry, Finance and Technology with IT. The sessions were run by student ambassadors and we followed a workbook written by Kings College Widening Participation Department. The club was a great success and the careers information, guidance and advice was extremely helpful as Year 9 students prepare to choose their GCSE options. The Year 9 students also took part in a Careers Day where they had visiting speakers from Fieldfisher Solicitors and a carousel of careers from which they had to select one career to make an presentation in the form of a television advertisement. The students did presentations about medical careers, careers in the music industry and media, the presentations were amazing! Twenty four students went along to the Strand Campus on the 12th July to graduate from the Kings Scholars Programme – the students had enjoyed the experience and it was amazing how quickly the time passed! The Year 7 students this year had a university taster day on Thursday 18th January. Twenty five students who will now be part of a three year programme spent the day at Kings College Campus in the Strand. They took part in activities including creating a university society they also learnt sign language – all learning how to sign their names. On Saturday 30th June Year 7 students who are part of the Kings Scholar Programme and their parents were invited to spend the day at the Strand Campus of Kings College. Ms Hine and Teresa also took part in a very interesting and informative day which was split into two programmes, one for adults and one for students. There was a series of workshops around going to university, a visit to the Courtauld Art Gallery, taster sessions and a campus tour. There was also a very tasty lunch provided! We were very lucky to have been offered the chance to take part in a project with Rambert Dance Company; this is sponsored by Coin Street Community Centre. We watched the company rehearsing ballet - there are 20 full time dancers in the company. The afternoon was then spent working with a choreographer, the students did different types of dance including salsa and contemporary, they were also taught how to stretch and warm down. The Rambert Dance Company will now be coming into school for 6 sessions working with 7C. As part of the Peabody Festival of Opportunities during half term a group of Year 11 students organised an event in school. This was called Dine ‘N’ Discuss, professional women came into school to hold a speed networking event with students. The evening started with an Ice Breaker game called Professional Bingo where students had to find someone who had the same job as listed on their bingo card. This was won by Ibukunoluwa Mohammed (9C) who won a box of biscuits. The session then started and students spent time with every professional they moved around the hall talking to all the female volunteers – this was strictly timed by Mrs Clements. We had a teacher amongst the professionals – Miss Hine! The evening was completed with a lovely buffet with more networking. All the volunteers were given a gift and a mug filled with sweets. The Year 11 students who organised the event were, Erica Aguiar, Magdalena Dimitrova, Antonella Espino Briones, Kayla Louis, Shanyah Marvin, Nicole Mora, Maddie Serry and Mabel Sodengbe these will all be awarded OCR Accreditations in Project Management. Nineteen students went along to Peabody’s offices in Westminster Bridge Road to meet up with professionals from the company. We started the session learning about how Peabody was started and how they run their housing projects today. We then split into small groups and professionals spent time with us talking about their careers which were varied and giving advice on how we can succeed in the future. Peabody very kindly provided pizzas for lunch! The students were split into three groups who then worked on a stand at London Bridge helping tourists, handing out leaflets and giving directions. They also all completed a First Aid certificate. The project is sponsored by The London Bridge Experience, City Cruises, Borough Market, Big Bus Tours, The Golden Hinde, the Monument, The Tower Bridge Exhibition and The Clink Museum. Unfortunately the summer programme was cancelled due to the death of one of the founders of the project. Unfortunately the summer programme was cancelled due to the major building works at London Bridge which lead to concerns about safety after the incident at London Bridge earlier in the year. The legal service was a celebration of the legal services in Southwark. We were invited by Judge Roger Chapple who was the former Honorary Recorder of Southwark. The students were welcoming guests and members of the legal profession and escorting them to their allocated seats. The Judges Processions included The Borough Commander of Police, the Senior Coroner for Southwark, the Chief Magistrate for England and Wales and many other senior figures from the Legal world. The students also took the collection which will be split between the Southwark Young Pilgrims and The Beyond Food Foundation which supports vulnerable adults to gain meaningful employment. The Bishop of Croydon the right Reverend Jonathan Clark was very welcoming and was impressed by the students and the way they presented themselves. Year 8 students had employability career sessions with MACE as part of their PSHE lesson. Women from MACE came to talk about careers and opportunities in the construction industry encouraging students to think of alternative jobs. The sessions were very informative inspiring students to work hard to achieve success. Thirteen year 10 students took part in an employability workshop in the Library on Friday 9th February. 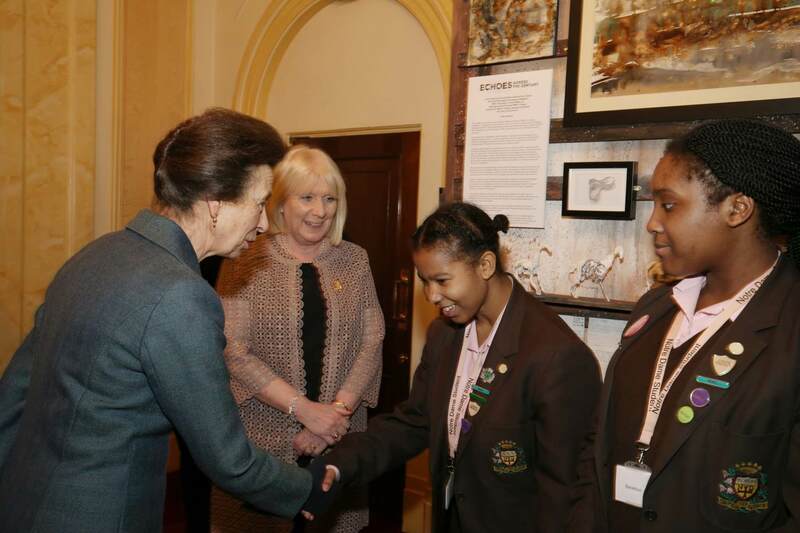 The programme was delivered by Young Enterprise and was sponsored by companies from the City of London. We started the day designing our dream lifestyles, we then found our dream jobs and had to reassess our budgets. We played a careers game which lead us down three pathways – apprenticeships, training and degree. We finished the day with practice interviews, some of us where employers looking for staff and the others were employees looking for jobs. It was a great day! The day began with an all-female takeover of the London Eye. We took part in speed mentoring with six professional volunteers. This year we were fortunate to be in a ‘Celebrity’ pod and networked with: Gillian Anderson (Actress), Dawn Butler MP, Julia Gillard (Former Prime Minister of Australia) Justine Greening MP, Baroness Doreen Lawrence and Ruby Wax (TV Presenter). Education and Employers a charity came into school on two occasions to deliver an assembly about apprenticeships to Year 10 & Year 11. Aisling Ledwith gave an introduction to Apprenticeships explaining the difference in the levels of apprenticeships, how to apply for apprenticeships, which companies now offered them and the vacancies available in this area. Eighteen Year 7 students went to Wembley Arena for WE Day which is a celebration of volunteering encouraging young people to take action in their communities, solving problems and fundraising. WE was compared by Yasmin Evans, Becca Dudley and Laura Whitmore who introduced musical acts Sarah Ikumu, Tokio Myers, Alexandra Burke and the Kenyan Boys Chior with The Tenors. They were inspirational speakers over the course of the day we listened to Princess Beatrice, Princess Eugenie, the actress Lily Collins who spoke of being bullied, the TV Presenter and entrepreneur Katie Piper who told her story of having to come back from having acid thrown in her face by an ex boyfriend. A young man called Callum Lynch who spent his life in care in Scotland told us how he turned his life around gaining a degree at Strathclyde University and a scholarship to Harvard University. We heard a story from Musharaf Asghar who was born with a terrible stutter and communicated by writing notes because he was so embarrassed, his life was transformed when a teacher at his new secondary school - Mr Burton helped him, he showed him that he needed to believe in himself to overcome his condition. Spencer West who is a speaker who lost both his legs as a child who has overcome his disability interviewed Sophia Grace who talked of her life as a ‘You Tuber’ and talked about the importance of continuing her studies and getting good GCSE’s. The day was inspirational and entertaining! Five volunteers came into school in January with the organisation Making the Leap to run CV writing classes for Year 10 students in preparation for their work experience in July. The volunteers visited for two sessions on Fridays during the PSHE lesson and showed the students how to best write a CV. The sessions also focused on skills needed for employment showing students how to develop these skills. All Year 10 students participated in an interview day in February held in the library, all students had a one to one interview with a professional in preparation for work experience. Students were allocated time with the volunteers talking about how to conduct yourself on an interview, showing students how to present themselves and give a good first impression. We had fifteen trained volunteers in school from HSBC Bank and Metro Bank and we are very grateful to them for their support. On Tuesday 7th November Making the Leap organised an event which brought together universities from all over England in Central Hall Westminster. Twenty five Year 9 students visited the show. Students were able to visit stands and talk to representatives who could give them advice and guidance about going to university and about choosing the right courses. Students came back with lots of information and felt the session was really positive. The universities at the event included, Leeds, Exeter, Kings College and The University of East Anglia. Making the Leap invited students from Notre Dame to entertain the audience at their 2nd Social Mobility Awards at the Marriott Hotel in Grosvenor Square on the 18th October. Venus Whyte and Emily Melzer sang Windmills of your Mind and Ms Hine and Emily played Canon in D by Pacheibel. Ella Hamilton accompanied the students and helped with the music and instruments. The Master of Ceremonies was Andrew Castle who was very complimentary about the girls saying how great they were! The evening was a great success and the students were great ambassadors for the school. Ten Year 7 students who were part of the Stretch Programme went along with Ms Philpot and Teresa to an event at HSBC Bank in Canary Wharf. The session was about employability focussing on careers in the bank but also gave great advice and information around employability and how to do well in your chosen career. The students heard talks from key people in the bank including the apprentice coordinator. We all took part in warm up activities and then twenty five volunteers did employability and enterprise sessions around the room, students visited all the different professionals. After the session was finished a lovely lunch was provided by the bank. On the 18th October, seven women who work in construction for Willmott Dixon came into assembly to talk to Year 10 students about the career opportunities in companies such as Willmott Dixon especially for women. There was a good range of careers among the panel, including surveying, project management and design. They were able to talk about their career paths which included apprenticeships. On Saturday 17th November six Year 11 students went to Cambridge to attend an ‘A’ Level subject Matters course this was run by the University of Cambridge and held at the Mill Lane Lecture Rooms. The day started with a session with student ambassadors who spoke about life as student and gave wonderful information about societies, how to fit in, support offered and general advice about choosing colleges and courses. Two admission tutors from Girton College explained that ‘A’ level choices can have an impact on university courses that are open to you – unsuitable choices might restrict your choices and that admission tutors like particular subject combinations. He advised students to use the UCAS website. They showed the students statistics of how many graduates go onto further study and employment and figures showing how much more money you can earn when you have a good degree. It was a very interesting and informative day. We were very fortunate to have Sarah Cowley, Head of the Prosperity Department at the Foreign and Commonwealth Office come into school on Thursday 22nd February to speak to Year 10 students in assembly. Sarah has a background of working for the Civil Service; she has a wide range of experience in many fields including being the British Ambassador in Latvia and the Operations Director for the 2012 Olympics! We decided to try a different type of assembly so five students - Diana Coelho Domingues, Christina Gurdas, Lucja Jedrzejczak, Emily Melzer and Wealth Ohenhen interviewed Sarah on the stage. We are very grateful to Speakers for Schools for linking us up and Sarah for taking time out of a busy schedule (she was on her way to Prague) to come into school. On the 15th November fifteen students with Ms Hine and Teresa went to visit St Anne’s College in Oxford. We travelled by train and then walked to the college in the Woodstock Road. The museum was very interesting we got to see the exhibitions as well as holding cockroaches! We are very grateful to St Anne’s College for the invitation. Ten students were invited to a Taster Day at Pembroke College in Cambridge. We travelled to Cambridge by train – we had an early start at 7.30am! The Taster Day was run by Pembroke College who have been very supportive of the school for many years. The day started with a welcome and some ice breaker games. We shared the session with another school from Northamptonshire. We had a talk on the University of Cambridge and advice on how to apply for entry. After lunch we had a Taster Lecture by who is Professor Gos Micklem Lecturer of Biology at the college. The day ended with a question and answer session and evaluations. It was a great day! Twenty Five students went along to the London South Bank University for an Experience Day in May 2018. We spent time in the Keyworth Centre and had sessions around student finance and reasons to go to university. We spent time with student ambassadors who talked about their experiences and gave advice and ideas about how to select courses and achieve good grades. It was a very useful session. Thirty Seven Year 10 students visited Roehampton University for a Taster Day. We travelled by coach on a lovely sunny day! The day started with a talk about going to university talking about courses available, the types of universities you can apply for and finance. We had a sample lecture from a PHD student about the Romans and we did an activity around this. We did a campus tour and scavenger hunt, walking the grounds of the university seeing all the facilities and the wonderful scenery; we saw ducks, geese and swans on the lake. Roehampton has a kitchen garden and grow food as part of their Growhampton project to sell in their café called The Hive. They also have 14 chickens the eggs are all used in the café, there are also two rabbits called Barnes and Putney! We did a session designing our own university which was interesting; we had to think about what we wanted from university and what sort of facilities should be on offer. We worked all day with student ambassadors and the day finished with a question and answer session with them. We then sat on the grass outside the library and ate our lunch which was lovely! Twenty Five students went along to The School of African and Oriental Studies in Russell Square. The day started with an introduction to the university there was a general talk about going to university, finances and how to course a course that inspires you. We then visited an exhibition of photographs from China and Siam. The students then had three taster sessions: Korean, International Development and Cultural Studies. We had lunch in the Refectory, a tour of the campus and then a question and answer session with student ambassadors. Twenty Tear 8 students were invited to the London Metropolitan Archives where we learnt about the Archives, saw how they keep all their documents and then visited the exhibition. The students were asked at the exhibition to find one character that was featured that they liked. We then made puppets out of newspaper and string and the puppets were then used in a show, the story was around being locked in the vaults at the Archives and being scared. The students had to incorporate the character in the story – we had Cleopatra and Charlie Chaplin. The session was great and the students got to visit something they would never have thought about – an archive, Tom Furber talked about the available jobs in the profession. Ten Year 10 students went along to the LMA Careers Day on Friday 16th March; we had a tour of the building and learnt about the archives. The students saw how the records are stored, preserved and renovated. We saw the collections in the basement, then visited the digital screening and conservation departments. The students then listened to a panel discussion by people who worked in the archives. We were invited to a photographic exhibition at the Oxo Tower Gallery called We Feed the World. This was an exhibition of photographs that celebrated farmers across the globe. It was a celebration of world renowned photographers, farming communities and farmers movements. The students completed a worksheet about how small famers contribute to the world food levels and showed farmers from all over the world. We were very fortunate to once again be involved in a project with Food Matters. Fareshare Recycling Project came into school to deliver an assembly about their work showing students how food is recycled and used to feed the homeless, they showed how food is rejected for various reasons such as misshapen vegetables, items with the wrong bar codes and supermarkets rebranding goods. Five students went along to the Fareshare Distribution Warehouse in Deptford to see how the charity redistribute the food, students packed an order and then followed the order to the Crossways Centre at the Elephant and Castle to see how the Southwark Asylum Seekers Day Centre make meals for the homeless. Five students then went along to the Borough Market to take part in Soup and Bread Making Master classes; students went to Bread Ahead to make ciabatta bread and spent time with Michaela Bowles a chef from Saturday Kitchen chef and made three soups, one Spicy Tomato, one Pea and Mint and a Pear and Parsnip soup. We had to have a trial run of making the soup to enable the Borough Market to come into school to have a food tasting to ensure that the soup was of the quality to be sold at the market. We made soup in school to be sold at the market and went along on Tuesday 6th February to sell in aid of the Fareshare project. It was a cold day but the students worked hard to sell the soup and everyone agreed it was very tasty! The four schools made enough money to pay for 1381 meals for the homeless. Mayor Charlie Smith drinking our soup out of our bowl! Nineteen students went along for a session at the Ministry of Justice; the session was led by Claire Toogood who is the Head of Youth Services learning about how the civil service worked and her role in the organisation. Volunteers came to work with the students they were split into groups and had a speed networking session and watched a film called ‘You be the Judge’ which resulted in them all debating about the trial shown in the video and sentencing the guilty party. It was a very informative session and the students were complimented on their excellent behaviour. On Tuesday 1st May Ten Year 8 students went to the Teentech 2018 event at the Emirates Stadium. Teentech is a one day event set up to help teenagers see the wide range of career possibilities in Science, Engineering, Technology and Maths. Teentech was founded in 2008 by Maggie Philbin and Chris Dodson to help young people understand their true potential and the see the real opportunities available in the contemporary STEM workplace. Six hundred pupils from thirty different schools benefitted from hands on exhibits and challenges run by leading organisations. The students visited stands run by Creative Skills Set, Atkins, Barclays, GSK, The Army and JVC Kenwood. The students used virtual reality headsets to welder, played with a computer graphics game that drove a car and built a dome. The first activity of the day was to draw a typical scientist and for the first time two students drew women!!! .The students took part in a challenge in the Innovation Zone that required them to design a device of the future – our students designed a compass for blind people called Blind Finder and we won an award for the Super Safety Inventor. Students also had to build a dome with Atkins and we were the team of the day building the structure the fastest – the staff on the stand said it was because we worked so well as a team. We all had a great day and enjoyed visiting the stands in our free time. The students were a credit to the school joining in and participating in everything they could! On Tuesday 16th October nineteen Year 7 students went along to the Worshipful Association of Salters for a workshop called The Layers of London. The session started with a talk about SALT and how the Salters were established, we then went into the archives to see the history of the association, we saw documents that went back to the Great Fire of London, and one deed had been burnt in the fire when the hall was damaged by the fire. We did an archaeological dig when we discovered items that have been found in digs in London including Roman oil lamps, coins, jewellery, china and metal items. The students dug with brushes and small spades just as the archaeologists would do, with care not to damage the finds. We then spent time looking at the remains of the original London Wall we measured how tall and long it was and completed a worksheet about the changes the wall has undergone. The Salters Hall is an amazing building which has artefacts, pictures and furniture that have a marvellous history. We are very grateful to the Salters for the visit especially Sheila and Noel who were our guides. Ian Powell a solicitor from Tuckers Solicitors came into school to talk to students about a career as a solicitor, he brought along two work experience students who are on placement with Tuckers and they were both able to tell us about their life experiences about ‘A’ Level choices, going to university and their future plans. Tuckers have offered a student in Year 10 a work experience placement in July. On Saturday 7th July three students went along with Mr Charalambos and Teresa to an art event at The US Embassy in Nine Elms. The building that cost £800 million was designed by Kieran Timberlake and opened on January 16th 2018. The event was to showcase the spectacular art that had been commissioned for the embassy. There is a programme called Art in Embassies founded by President John F Kennedy in 1963 that ensures that art is displayed in embassies all over the world for everyone to enjoy. We were invited as part of a Young Leaders Project by Peabody who very kindly took us out for a pizza after the event. We were very fortunate to be invited to take part in an Art Project with Stones End Day Centre; we worked with an artist called Elle Shipman who organised small workshops with the clients from the day centre and small groups of students from 7M. The students worked on subjects such as fashion, music and food. A newspaper was created showing the outstanding work that was done. A mural was created after the students had created art work of their favourite things – Haribo sweets are part of the display! A Time Capsule was created and filled by students and the elderly – we all took along an item that was an example of the present day – we took items such as a mobile phone, a school badge and a pencil case. 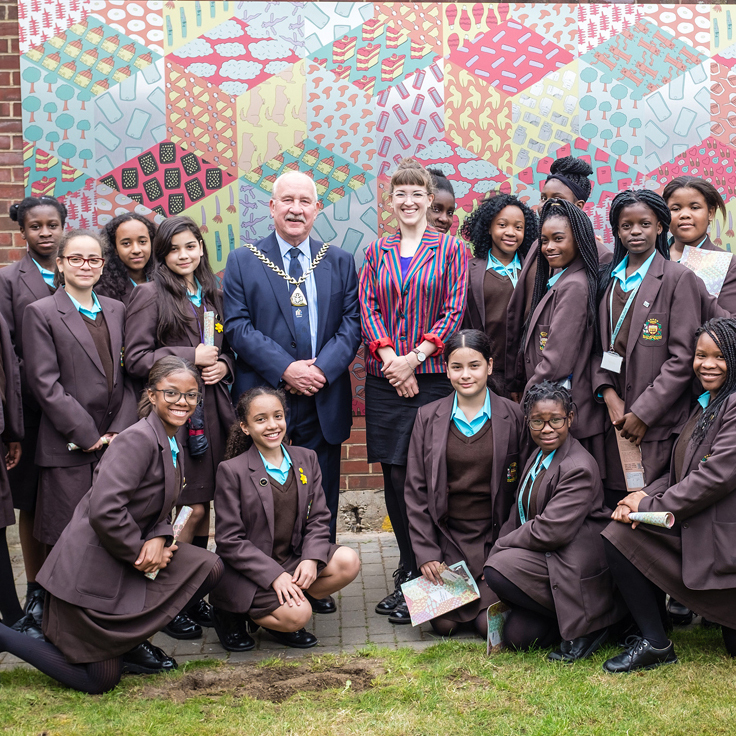 The Time Capsule was buried and the mural was unveiled by Charlie Smith the new Mayor of Southwark at a celebration event which saw the students singing and dancing in celebration with the members. St Georges University came into school to present to workshops about careers in the medical industry workshops were held as part of the Year 10 science classes. One was on general Healthcare Science and the other was Para medicine. Both workshops were very hands on and the students were shown how paramedics provided first aid, how blood pressure is taken, how to check oxygen levels and artificial respiration. The sessions were delivered by student ambassadors and were very informative. 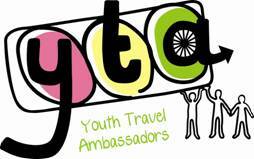 The Youth Travel Ambassadors went along to London Transport Headquarters at St James Park to take part in a Dragons Den Competition to win funding for their next campaign. The campaign this year is around students not concentrating when crossing the road, the presentation included statistics around the number of road accidents each year involving teenagers. The students will be taking part in assemblies in our school and St Georges Primary using an obstacle course to show the difference in the obstacle course concentrating then being distracted sending a text message. On November 29th two students, Shania Mignott and Malinah Kamara who are both Junior Travel Ambassadors went along to an awards ceremony at the Oval to collect our Bronze Award for the STARS project, we are now working towards the silver and Gold awards. This is a project which recognizes the schools commitment into the Mayor of London’s travel plan and being a healthy school. 11J and Ms Sawyerr collected money throughout the term which enabled them to make a Christmas Bag for the elderly at stones End Day centre – we made 25 bags which were given to the members on Thursday 20th December as part of their Christmas celebrations. We continue in school to have two mentoring schemes with Bristows Solicitors matching mentors with students in Years 10 & 11, there is a total of forty eight students who take part in the scheme. Mentors come into school once a month and work in small groups in the library. We are very grateful to Bristows for their continued support of the school. Year 10 have also started two new mentoring schemes with Wordbank and Standage we have 14 new mentors who are coming in once a month to work with 30 students helping them with work experience applications, cv writing, exam revision skills and study skills. Seven students who are members of the school council along with Mr Hornby and Teresa as part of British Values went along to City Hall for a visit this included a tour of the building, visiting the Mayors Living Room on the 9th floor to see the marvellous view of London and we had a talk about how London is governed, learning the difference between local government, London government and the Houses of Parliament. We saw the areas that the Mayor Sadiq Khan’s is responsible for and how he looks after the interests of all the residents in London. We spent time in the chamber where all the big debates take place and decisions are made about London. We then watched a film that showed us the history of London and all the big events that had changed the town. Twenty five students, Mrs Carroll and Teresa went along to the Make the Future event in Stratford – this is a STEM event which introduces students to STEM subjects through interactive workshops and displays. Students powered the cities of the future, planned virtual reality baseball games, built a floating solar farm and investigated how low carbon worlds would look like. It was a very hot afternoon so we finished the day with an ice lolly. We had an opportunity through SE1 United and Contemporary Applied Arts to hold a series of workshops in school working with clay around ideas of identity. We worked with an artist called Robert Cooper and over three weeks students painted, made clay models and designed tiles. 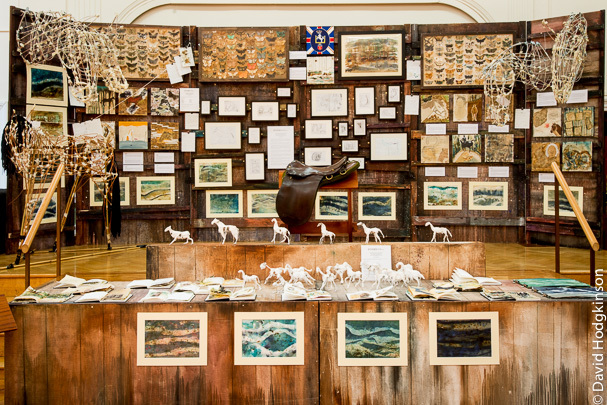 The work was displayed at the Contemporary Applied Arts gallery in Southwark Street and the students with their parents went along for a celebration event and official opening. We have been doing some further work with Robert Cooper funded by Contemporary Applied Arts, we have working on a project about identity students have been painting tiles and then transferring their work onto clay. Students built towers, made models of buildings in London, thought about the challenges of owning a business, decorated muffins, thought about jobs in a hospital and learnt about the courses at reading university. One of the main themes of the fair was apprenticeships. The fair was very successful and students collected a lot of information.